This Brand New Absco Highlander Garden Shed fits into most suburban backyards and it is very popular due to the extended wall height of 2.035m. Brand New Absco Highlander Garden Shed fits into most suburban backyards and it is very popular due to the extended wall height of 2.035m. 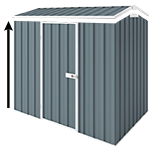 The Highlander range of our Absco garden sheds is manufactured from Australian made low maintenance ribbed BlueScope Steel sheeting and is designed to add value to your home while addressing your storage needs. It is very popular among customers looking for a great quality Absco shed with the extra height walls and doors for easy access. This is actually the only shed from Absco in this size with the 2.035m wall height. For permanent secure installation of your shed it is recommended to use anchors. To be able to secure each wall panels to the concrete slab you will need 14 anchors for this 3m x 2.92m Highlander shed. Packaging size and weight for your convenience to help you organise your transport if you choose our popular FREE depot delivery option. The Highlander range is engineered to withstand winds of up to the wind rating N2 (147km/h). It is ideal for non cyclonic areas, not available in cyclonic. This Australian made shed comes with 30 year written warranty.